Matt Austin in the operating room during a hip replacement surgery. Bill McDonough's 71 years have been active: four years with the U.S. Navy, 22 years in a police department, and a stint as an electrical teacher before retiring to Huntingdon Valley, where he rides his bike, walks in the park, and golfs. But six months ago, the pain in his left leg sidelined him. McDonough decided he had pulled a muscle, but rest didn’t make the pain go away. McDonough’s doctor sent him to an orthopedic specialist, who told him he was showing classic signs of osteoarthritis. “Diagnosed with age,” McDonough quipped. The prescription: surgery to replace his degenerating hip joint. According to the Centers for Disease Control and Prevention, 332,000 total hip replacements are performed each year in the United States. Matthew S. Austin, director of joint replacement services, at Rothman Orthopaedic Specialty Hospital in Bensalem, performs more than 300 total hip replacements a year. He and McDonough allowed a reporter and photographer to see what happens during this increasingly common procedure. The hip joint is made up of two parts: the socket in your pelvic bone and the ball that sits on top of the femur bone in your leg, known as the femoral head. In between these two parts is cartilage, tissue that cushions the bones and enables the joint to move easily. In osteoarthritis, the cartilage deteriorates so badly that bone grinds on bone, causing chronic pain. McDonough is a typical patient for Austin, though in recent years the doctor has started to see an uptick in younger patients. Some have suffered wear and tear due to sports injuries, others' joints have worn out prematurely because of obesity. “Over the last 15 years, the materials have gotten better so the thought is that we can now give younger patients a much longer-lasting replacement,” Austin said. The ball of the hip joint shown on a surgical table. Those materials create the “bearing” where the socket and ball fit together to fashion a moveable joint. Austin prefers a metal cup to replace the socket, a plastic liner to act as the cartilage, and a ceramic ball for the femoral head. “Since we started using a highly cross-linked polyethylene liner, wear rates have been very low, so we’re hopeful that even young patients will be able to get one hip replacement and that would be it,” Austin said. Austin makes a five-inch incision on the outside of McDonough’s left leg. Once he can reach the joint, he dislocates the hip in one swift motion. Using a sterile tool that almost looks like something you’d find at Home Depot, he saws through the femur in order to remove the damaged ball from its socket. Before putting the implants into place, Austin cleans out the scarred bone and soft tissue along the socket. Then, he takes a tool similar to a cheese grater to the bone that’s left to create some bleeding. “The implants have a porous surface that allows for bone ingrowth,” said Michael Geissler, a nurse and director of perioperative services. "If there’s no bleeding bone, the coating on the implants won’t adhere properly.'' It takes a few months for the new joint to grow into the bone, he said. Next, a metal cup is “press-fit” into the socket. The cross-linked plastic liner is snapped into the cup to create a smooth surface on which the new femoral head will glide. The metal cup is “press-fit” into the socket. Austin then hammers a metal stem down the shaft of the femur about four or five inches. This is where a ceramic ball is attached to form the new femoral head. The next step is to test the new joint to make sure everything fits properly. “The primary goal is stability of the hip and making sure the implant won’t dislocate,” Austin said. He shifts the leg into different positions to make sure the new joint won’t pop out under normal movement - and to be certain the metal stem holding the ball isn’t too long. “If the fitting is too long, you’re going to impinge or stretch a nerve in the leg, so now is the time to figure that out,” Geissler said. 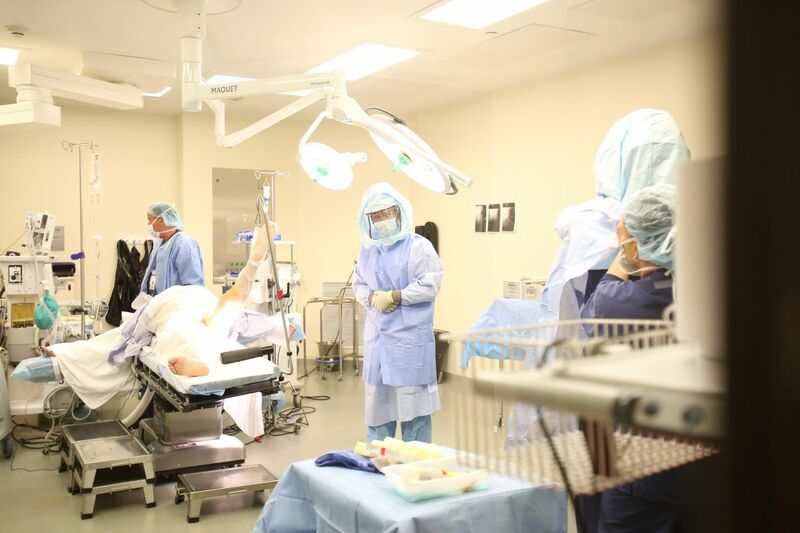 The secondary goal is to get the patient’s leg lengths equal. The last step is to inject antibiotics into the new joint and cleanse the area of any debris before closing the incision. In just a half hour, McDonough has his new hip. McDonough was up and moving with the help of a walker only a few hours post-op. Though hip replacement surgery once meant significant time immobilized, now doctors know that patients do better if they keep moving. A physical therapist gave him a list of exercises to do, in addition to walking, to strengthen the hip and restore movement. Rothman patients are advised to follow an online exercise program for at least six weeks after the surgery. Austin defines a successful surgery as one that gets a patient back to what he was doing before the pain took over his life. By that measure, he said, hip replacement has an excellent track record. The other two percent of cases will suffer from one of three common complications: a dislocated implant, a hospital-acquired infection or a blood clot. Within six weeks, McDonough was back to walks in the park without pain. Now he has a new goal: Keeping up with the new baby his daughter is soon expecting.